Another day, another spill in the Gulf. Or two. Map showing locations of two recent NRC oil spill reports relative to Mississippi Delta, chronic leak at site of platform 23051, and BP / Deepwater Horizon spill. Pink dots are locations of active oil/gas platforms in Federal waters. Yesterday’s MODIS/Aqua satellite image shows a couple of small slicks in the Main Pass area, a region jam-packed with offshore oil and gas platforms and pipelines. 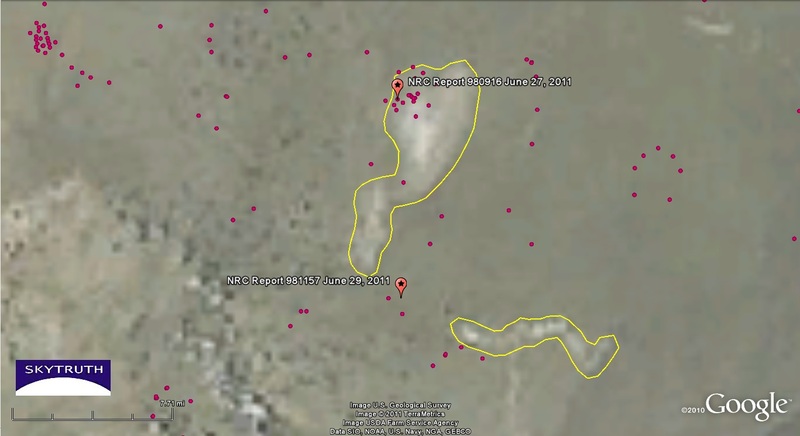 The two slicks we’ve outlined in yellow below appear to be closely associated with two recent National Response Center oil spill reports, one (#980916) submitted on June 27 and the other (#981157) on June 29. 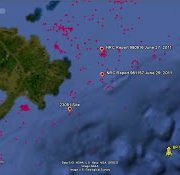 The report on June 27 indicates the spill location (but not necessarily the source) as a manned oil/gas platform in Main Pass Block 299, installed in 1991 and operated by Freeport McMoRan Energy LLC. (LLC…really? Think about that for a moment. This is a division of a multinational mining and energy conglomerate that, among other things, operates the massive Grasberg Pit in West Papua that is steadily smothering lowland rainforest with tailings.) 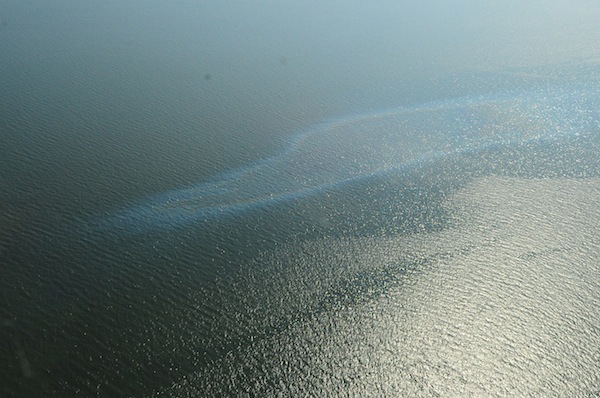 No amount spilled, or estimate of the size of the oil slick, is given in the report. The slick is described as being dark brown, which indicates something thicker and more substantial than the “unknown sheen from unknown source” so frequently described in NRC reports. Detail from NASA MODIS/Aqua satellite image taken June 29, 2011. 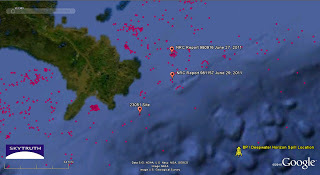 Red pushpins mark locations of NRC spill reports on June 27 and June 29. Pink dots mark active oil/gas platforms in Federal waters. Scattered clouds and shadows at lower left. Strong sunglint on this portion of the image makes areas of smooth water (including oil slicks) appear very bright. The possible slick seen on the June 29 MODIS image in that area covers 75 km2. At 1 micron (one 1,000th of a millimeter) thick, that would be 19,800 gallons (a “medium” spill by Coast Guard definition). But standard guidelines for estimating a slick’s thickness from its appearance put a “dark brown” slick in the 50 micron range. 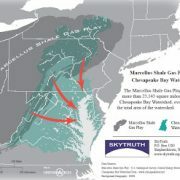 That would be a spill of 990,000 gallons (23,571 barrels), and a Clean Water Act fine of 26 to 101 million dollars. But somebody in the federal government needs to step up and actually start fining companies for these spills (our intern Michelle is looking into this enforcement question). We think this is critical to improve offshore drilling safety: a credible and consistent financial incentive for operators — large and small — to take better care of business, one of the keys to avoiding the next major spill. 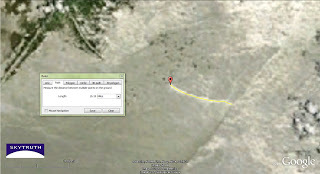 Possible oil slicks delineated with yellow line. 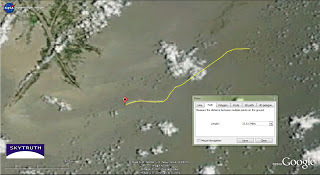 The June 29 report describes a 125-gallon spill in Main Pass Block 313 creating a “silvery sheen” (very thin slick) of oil about 26,000′ long x 2,600′ wide drifting southeast from the source. The report gives the spill location (again, not necessarily the source) as a platform operated by Chevron. 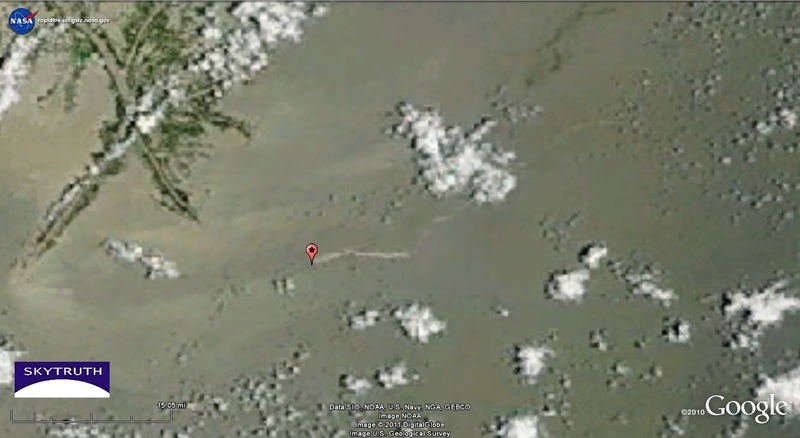 This roughly matches what we observe on yesterday’s MODIS image: a possible slick that’s about 9 miles long and 25 km2 in size, beginning about 3-1/2 miles southeast of the platform location. Assuming the slick is 1 micron thick, the total amount of oil it contains should be closer to 6,600 gallons (157 barrels). 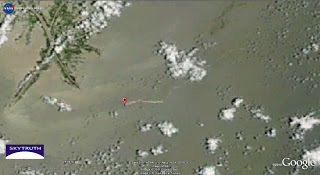 Oil Slick Near Venice, Louisiana – Federal Officials Stumped? We hope not, since we’ve provided plain-as-day photos of a leaking platform not far from where the slick off Venice, Louisiana was first reported. 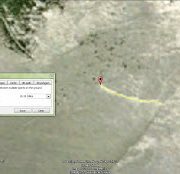 Maybe the Venice slick had another as-yet unidentified source, but the slick encountered by our Gulf Monitoring Consortium partners from a well likely owned by Saratoga Resources, Inc. clearly indicates a problem at this precise location: 29°31’29.40″N / 89°19’60.00″W. What’s not clear: what – if any – action will be taken by state and federal officials to address that spill? 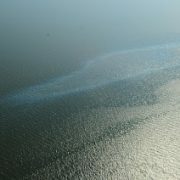 Oily sheen spotted from Coast Guard aircraft near Venice, Louisiana on June 9, 2011. US Coast Guard photo by Petty Officer 3rd Class Stephen Lehmann, courtesy gCaptain. At any rate, the Coast Guard has declared the cleanup of the slick off Venice “complete,” even though no oil was actually cleaned up – apparently it all dissipated before coming ashore. We’ll let you know when as learn more about this unresolved incident. https://skytruth.org/wp-content/uploads/2011/06/Venice-slick-photo-9june2011-CoastGuard.jpg 212 320 John Amos /wp-content/uploads/2016/08/test_logo.png John Amos2011-06-15 19:28:002019-02-26 09:28:34Oil Slick Near Venice, Louisiana - Federal Officials Stumped? Oil Slick Near Venice, Louisiana – Who Owns the Well? Using the Louisiana state data site, SONRIS, we’ve learned that the well in question has, in name at least, changed hands three times. 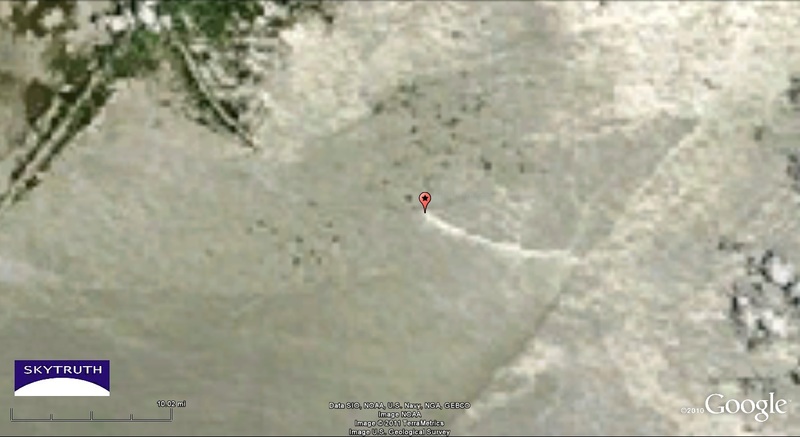 According to SONRIS it was drilled in 2004 by Amerada Hess; bought in September 2009 by The Harvest Group, LLC of Covington, LA; then taken over in 2008 by Lobo Operating, Inc. of Covington (apparently the successor corporation to The Harvest Group). Dial Lobo’s phone number now and you get a voicemail greeting for Saratoga Resources, Inc. Saratoga is the successor to (or purchaser of) Lobo and Harvest; all three entities filed Chapter 11 bankruptcy in 2009. Saratoga emerged from Chapter 11 a year later. We don’t know for sure if Saratoga owns the apparently leaking well, but it seems likely. This LLC shell-game with offshore drilling sure can be confusing — we call it Responsible Party Whack-a-Mole. 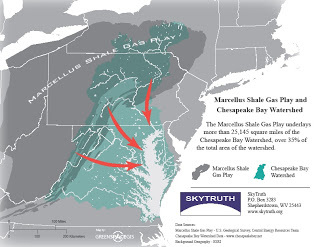 And it sure does make us uneasy to learn about small, bankrupt companies responsible for operating and maintaining offshore oil and gas wells, when other livelihoods are put at risk from both chronic pollution and catastrophic spills. We hope the Coast Guard is using the info we publish, but we haven’t had any direct contact with them. Gulf Restoration Network has provided info directly to the Coast Guard for this leak, which as far as we can tell has not been officially reported to the NRC by the responsible party as required by law. We’re continuing to look for better imagery of the area, and the Gulf Monitoring Consortium will continue to coordinate our efforts to investigate and publish information about pollution incidents like this one. /wp-content/uploads/2016/08/test_logo.png 0 0 John Amos /wp-content/uploads/2016/08/test_logo.png John Amos2011-06-14 18:12:002017-09-15 12:06:48Oil Slick Near Venice, Louisiana - Who Owns the Well?